The remains of the east end of the church are truncated compared with the large structures of the Choir and North Transept. A glance at these shows how magnificent the structure must have been. This was a later stage of building. The original romanesque church was modelled on the motherhouse of St Albans Abbey with its seven apses – even the stairways to the transepts are in the same position. 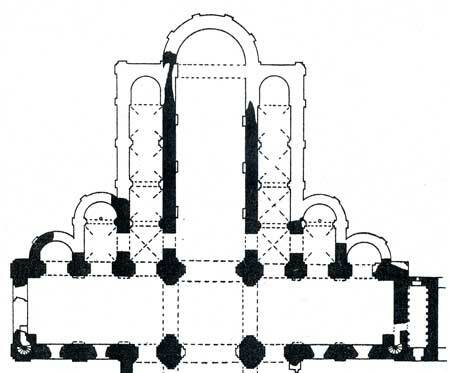 The lines of the original apses are marked on the ground in the Presbytery, and those in the transept and Chapter house are still readily visible. The building continued to develop over the next 400 years as priors repaired and ‘updated’ the existing buildings and added new ones as need arose. A plan of developments in the presbytery and parish church, is to be found in Fairweather, F.H., 1929. “Norman Apses in Norfolk Priory Churches”, A Supplement to Blomefield’s Norfolk, p. 315, which is reproduced separately. The High Altar was at the centre of the Presbytery, and here High Mass (Missa solemnis) would be said daily at 11 o’clock, with all the monks taking part. The essential difference between High Mass and the other masses of the day, was the presence of a deacon and subdeacon to assist the celebrant; the deacon would also chant the Gospel for the day, and the subdeacon the Epistle. They would (if possible) be accompanied by a choir, a thurifer (who was responsible for the incense) and acolytes (who carried candles). 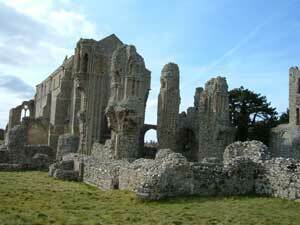 The monks’ day was punctuated by different services, and these have been outlined in A Benedictine monk’s way of life. Like the rest of the Presbytery, the south aisle has been changed over the years; the apse was squared off during the 14th century and it appears that a wall was built across the aisle from the central pillar. 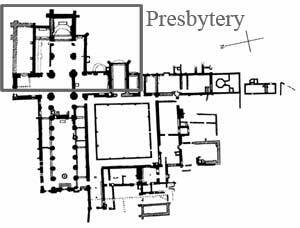 The westerly part of this was used as another chapel and the piscina and the remains of an aumbry are still visible in the wall (as marked in the plan above). 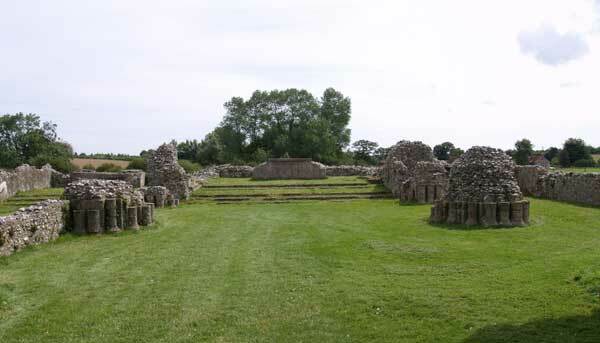 The most easterly altar (above right) had a niche to the left which may have held a statue, in front of which part of the original tiled floor remains exposed. 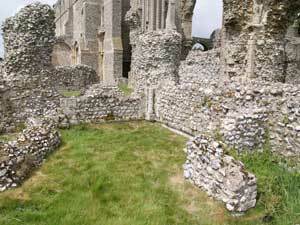 The sacristy was essential to the running of the priory, and no concrete identification has been made for its situation. 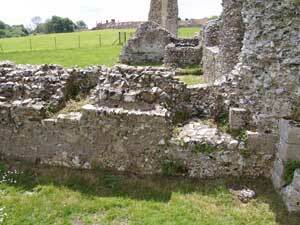 It was not infrequently placed in Benedictine churches on the south side of the presbytery, next to the chapterhouse, and there are remnants of such a possible structure at Binham. This is in the same position as the sacristy in the parish church and in countless other churches of this period. 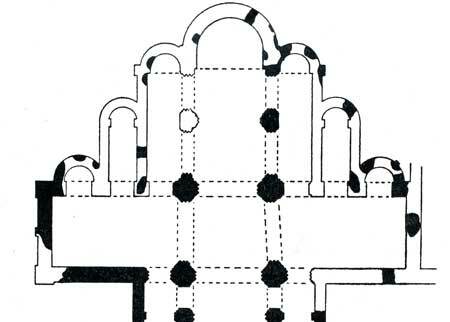 A suggested outline for the room is indicated by dotted lines in the plan above. 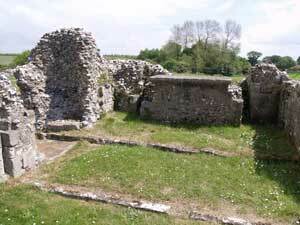 The left picture shows the context of the sacristy; in the centre of the middle picture, and abutting the structure in the righthand picture, columns can be seen, showing that the room was originally vaulted. The rectangular structure coming out of the wall may well be the remains of a water tank, which would be necessary for washing the Eucharistic vessels, and keeping the presbytery clean. His office was to see that there should nothing be lacking within the church as to provide bread and wine for the church and to provide for wax and light in winter. He had always one ton of wine lying in the said Checker for the use of the said church, he had also Seggersten Hewgh [ a manor ] in keeping it was his charge, and St Margaret's Ward [ Wood? ] in his office[ as sacristan ]. Also his office was to see all the glass windows repaired and mended and the plumbers work of the church: with mending of bells and Bellstrings and all other works that was necessary to be occupied both within the church and without the church, and to see the church to be cleanly kept, all these things was always to be called for at the Sacristan's hands as need required. The sacrist (called above seggersten or sacristan) thus had a wide range of responsibilities, which he funded from manors which were owned by the priory and allocated to him. 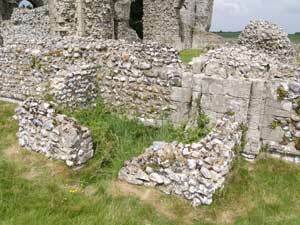 The sacrist of Binham would have been in exactly the same position as his counterpart at Durham. It is probable that the manors and tithes allocated to him, were intended to supply the daily needs of the priory from service books to candles, but further funds would have to be found for any major work which had to be undertaken on the fabric, glass and roof of the priory for which he was also responsible.